Fine Art Shippers offers an extensive range of gallery services, from gallery framing and exhibition set-up to fine art shipping and crating. As a result, we work with many reputable galleries and dealers, serving their needs at every step. For instance, we ship art for Impact Art Gallery, deliver artworks to Peanut Gallery, pick up art from the amazing Clic Gallery, and provide Galleria ZERO with comprehensive gallery framing and art installation services. Moreover, since our company is headquartered in New York, we spend much time visiting modern and contemporary art galleries located in this fascinating city. In this blog post, we want to tell about one of them – the superb Taglialatella Galleries that is definitely worth special attention! Taglialatella Galleries is a well-established network of fine art galleries with locations in New York, Palm Beach, Paris, and Toronto. Moreover, it is currently one of the most influential dealers of pop and street art by significant contemporary artists. 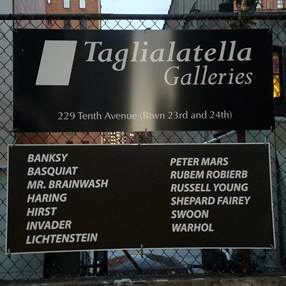 For example, Taglialatella Galleries is exactly the place to find authentic works by Banksy, Andy Warhol, Jean-Michel Basquiat, Tom Wesselmann, Roy Lichtenstein, Jeff Koons, Alex Katz, Robert Indiana, Damien Hirst, and many other famous artists. Besides, this outstanding gallery is also known for organizing high-quality events and exhibitions, displaying modern and contemporary art in a range of genres. Highly recommended! Whether it comes to gallery framing, exhibition set-up, or fine art shipping services, our team is always ready to handle any of your art-related needs! Contact Fine Art Shippers today for more information!